For many years, neuroscientists believed they had identified a specific pattern of brain activity acting as a kind of "signature" for pain in the brain. Recently this so-called "pain matrix" has been called into question, and a new study by British researchers may have shattered the myth once and for all. The pain matrix is actually a cluster of regions in the brain that prior imaging studies indicated are involved in processing pain perception, including the posterior insula and the anterior cingulate cortex. This has been so broadly accepted that the signature pattern has been used to declare that emotional pain (like social rejection) and physical pain are the same thing, as far as the brain is concerned. The argument goes that something like a bad romantic breakup has the same effect on brain activity as spilling a hot cup of coffee on your shirt. More recent studies have cast doubt on those conclusions, however. 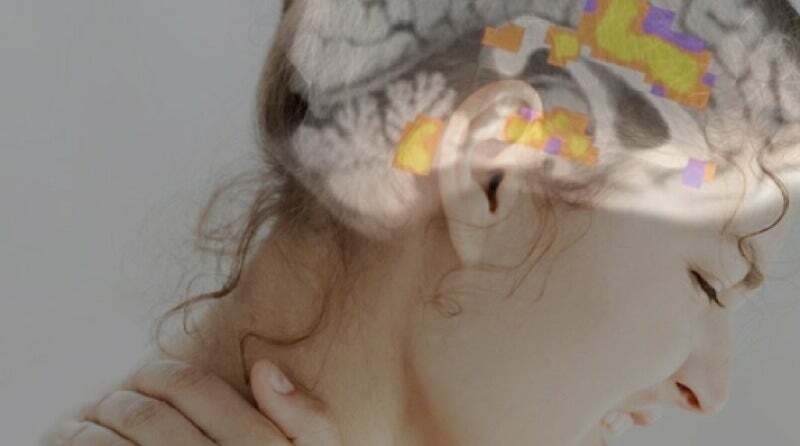 And now researchers at the University of Reading and University College London have concluded that this cluster of regions in brain is not specific to pain. It also responds to loud noises, bright lights, a strong non-painful touch (like a firm handshake) and, yes, social rejection. They describe their findings in a new paper published today in JAMA Neurology. "I wouldn't say that's it's wrong to say that the 'pain matrix' is involved in processing pain," lead author Tim Salomons (University of Reading) told Gizmodo. "What's wrong is the idea that it is specific to pain — in other words, that when you observe this pattern, you can just assume that person is in pain." 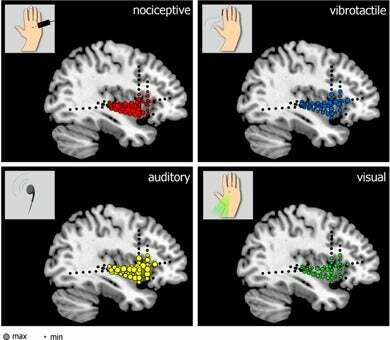 Most of these studies employ functional magnetic resonance imaging (fMRI). Unlike conventional medical MRI, which creates a static image of the brain similar to an X-ray, fMRI monitors the brain in action. When enough neurons fire together in response to a given stimulus, blood flow increases to those parts of the brain involved in processing that input. The fMRI detects this as slight increases in blood oxygen levels — the so-called BOLD response — in those different regions. The resulting gorgeous full-colour images make for terrific eye candy, but they aren't actually real-time snapshots of the brain in action; rather, they're visualisations of statistical data. So how can scientists know for sure if the pattern they're seeing is really an indicator for pain (or any other type of cognitive process)? The gold standard is cognitive neuroscience studies that involve patients with existing brain damage, according to Bradley Voytek, a neuroscientist at the University of California, San Diego, who was not involved with the study. So if you want to prove that a particular cluster of brain regions encodes pain, you must first determine that patients with damage to those regions can no longer feel pain. Image: G. Liberati et al. That was the gist of a study published in January in the journal PLoS Biology by Belgian scientists. Led by Giulia Liberati of the Universite Catholique de Louvain, the study involved six epilepsy patients who had electrodes implanted in their insula — part of the treatment for their epilepsy. Then they zapped the patients with a small laser to induce pain, along with other non-painful stimuli. The result: every type of stimuli produced the telltale pattern of activity, regardless of whether it was genuinely painful or not. This suggests that the insula plays a far more general role, perhaps acting as a connecting hub for other brain regions involved in sensory perception. But that is just the first step in disproving the connection, according to Voytek. You also must determine whether patients who can't feel pain — a rare condition known as congenital insensitivity to pain (CIS) — show no brain activity in those regions. If they do, that means those regions can't be solely associated with pain. That's the significance of this latest study, which involved two people with CIS and four other subjects with normal pain perception of roughly the same age. Subjects were monitored with fMRI to measure their brain activity while experiencing painful "pin pricks". The CIS subjects showed exactly the same brain activity in response to the stimuli as the healthy subjects, suggesting once again that the pattern of brain activity was not specific to pain after all. Granted, it's a small sample size, but combined with the other recent studies, it makes for a convincing case. So how did this notion of a pain matrix became so prevalent in the first place? "I think [it's] because the findings are so consistent in neuroimaging studies of pain," said Salomons. And animals studies have shown that several of the regions in that cluster are most certainly involved in processing pain. They're just not exclusive to pain perception. The next step will be to augment the human brain imaging studies with animal research. As useful as fMRI can be, "It just tells you that things are occurring together [in the brain], not what the specific relationship is," said Salomons. "So it can tell you what is happening in a person's brain when they are having a particular experience, but it doesn't tell you whether that brain activity is causing the person's experience." Voytek likes to draw an analogy to running on a treadmill while hooked up to a machine that records muscle activity from the arms and legs. The arms will move faster and faster as the speed of the treadmill increases, so there will be a strong correlation between how fast the subject is moving and the rate at which the subject swings his or her arms. But that doesn't mean the arms are where running happens. The same holds true for brain imaging studies. There can be strong correlation, but this does not necessarily indicate causation. Animal studies could be useful to help researchers like Salomons better understand how the brain creates the perception of pain. This should enable them to look at individual brain cells and manipulate or modify them in ways that are simply not possible with human subjects, thereby pinpointing the functions of particular regions, or even specific neurotransmitters (chemicals that relay electrical signals between brain cells). "We all know that pain feels different from a bright light or social rejection," said Salomons of the challenges that lie ahead. "We have to develop new ways to understand the mechanisms that make these experiences different. I think understanding that the 'pain matrix' isn't specific to pain helps push us in the right direction." Top image: National Institutes of Health. Public domain.